I saw BOMBSHELL when it played at Tribeca and fell in love with it. Actually all of the critics did and it was the one film at the festival that everyone loved and had on their must see list. Go see it. BOMBSHELL is a great film. Its a loving portrait of a woman who basically changed the way the world works but whom history has pigeonholed as just being one thing- beautiful. This film is the story of actress Hedy Lamarr, a woman who loved to tinker and invent. Invested with a curious nature by her father she found that people were more interested in her looks than in her mind. This resulted in numerous bad marriages because her husbands couldn't relate to the thing that really drove her, an undying curiosity. Oddly Howard Hughes could relate to what she wanted to do and during their brief affair he gave her the tools and equipment to tinker at home. The focal point of the film was Lamarr's realization about how to encrypt radio transmissions. The ability to use alternating frequencies meant that signals could be sent and not intercepted unless you had the key. It was an invention that she patented and turned over to the government. However the people in the Navy refused to use it. Later on as Lamarr was bringing in millions of dollars in war bonds they outright seized it claiming it was the work of a foreign national. It was "forgotten" until the 1950's until the patent was used as the basis for radio guidance during the cold war- but still no credit was given to Lamarr. Credit eventually came in the 1990's when the man who worked on the guidance system in the 1950's said everything he did came from Lamarr's patent. If you want to know why this all matters it is because it's now the basis of cellphones and wifi communication. 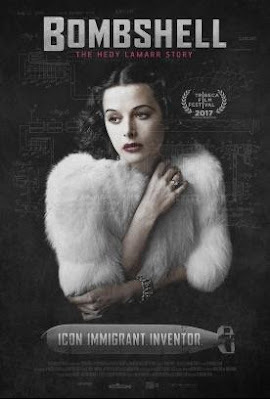 The film is largely told in Hedy's own words. Using an interview she did in the 1990's the film expands upon it with talking heads of her family and the friends who knew her. Its a film that will move you- as it did the critics screening where applause erupted at the end- that may not mean anything but it was the only time in the 80 or so screenings I attended during Tribeca that the audience of critics reacted in anyway. BOMBSHELL is a film that shows that women can be both smart and beautiful and that great ideas can come from unexpected places. It is a rallying point for anyone to do what they love because it may give great rewards. Watching the film one can't help but feel pissed off that the fact that Lamarr was one of the most beautiful women in the world at the time seemed to disqualify her from being a scientist. Should we even try to imagine what the world would have been if Lamarr has been allowed to chase her dream? This is a film that needs to be shown in schools and to any kid of any age who has a dream that they want to follow. This is a film that needs to be seen as a warning about what happens when dreams are stifled. Yes she created something wondrous but she may have done more and history may have been changed even more. This is one of the best films at of 2017. It is a must see when it plays at a theater near you or on American Masters on PBS down the road.